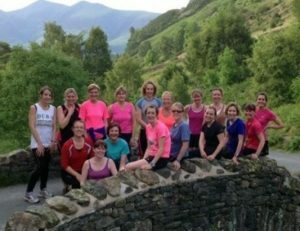 The Wednesday run is a social run for Keswick AC ladies, we aim to run about five miles (sometimes more) with as much talking and laughing as we can fit in! It’s for any level of runner, faster, slower louder or quieter! The routes are usually trail but sometimes road starting from the Cenotaph at half six. We head out around the woods and trails of Keswick but we also head up some of the local fells like Walla and Lattrigg. To keep all speeds moving we pick points along the route to gather, faster runners turning round to run back to slower ones! We also do some effort sessions or squeeze these into running routes to help push our speed! It’s great fun and we often stop to take photos and even have the odd dip in the lake mid run!